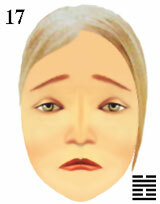 Gallery of emotions for cosmetic facial images. If face of a woman expresses sad emotions, but joyful emotional image is created by means of cosmetic make-up, then as a result facial appearance will not be beautiful as unnatural joy gladness will be unattractive. Joyful eyes seem sorrowful as eyebrows and mouth express sad emotions. Sad eyebrows and mouth can seem glad as eyes express joyful emotions. Pleasure is sorrowful in eyes of the person, but it seems because of sad ideas and feelings. Annoying ideas and mournful feelings contradict eyes in which it is possible to notice or observe arising desires. emotional facial image for beautiful cosmetic make-up.